Those of us researching our Pemberton origins owe a large debt to Robert Charles Boileau Pemberton (I shall refer to him for convenience as “RCB”) who on his retirement in 1892 decided to try to assemble a genealogy of the Pemberton family. Born and baptised* in Calcutta in 1834 [Editor’s Note: In another place on the same referenced page, we see a note saying that he was 86 years old at death in 1914 which places his birth in 1828. ], he had a distinguished army career, rising to the rank of Major-General in the Royal Engineers. In retirement, he lived in South Kensington, London, and so was ideally placed to use the capital’s library resources, especially those of the Guildhall, the London Library, the Public Record Office and the British Museum (which housed what is now the British Library). He was a member of the Society of Genealogists. His funeral was held at Brompton Cemetery on 28 Dec. 1914, after a service at St. Peter’s, Cranley Gardens, London S.W.7. 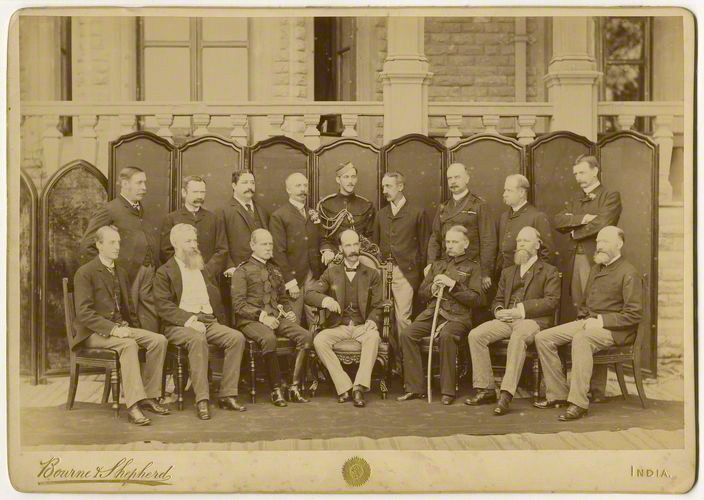 The photograph on the right, taken about 1890, is of a group of Indian civil servants, one of whom is RCB. The problem is, we don’t know which one! The following information about RCB’s own family is based on Chart 13, entitled St. Albans Family. West Indian Branch, in the published collection of Pemberton Pedigrees. His parents were Robert Boileau Pemberton, a captain in the Indian army, and Henrietta Peach, who married in 1832. His paternal grandparents were the Rev. John Butler Pemberton and Harriet Price (née Boileau) who married in 1797. RCB married twice, firstly to Alice Louisa Barrow, in 1862. They had four children, all born in India: Alice Evelyn (1863), Catherine (1864), Annie Gertrude (1866) and Robert (1868), who became a priest in the Church of England. His second wife was Marguerite Ellen Brennan, whom he married in 1876. She bore him a son, Edward Gerald (1877), also born in India, who, when the Pedigrees were published, in 1923, was a Captain in the Warwickshire Yeomanry. Chart 13 lists three further descendants up to 1923: Robert married Ethel Frances Arnould in 1894 and they had two daughters, Ethel Vera, born 1895, and Katharine Frances, born 1897. For more information about Robert, see below. Edward Gerald married Yolande Constance Dietz (born in Florence) in 1902 and they had a son, John Boileau Pemberton, in 1903. The Will and the Books. By the time he died, RCB had collected or drawn up forty pedigree charts of various Pemberton families, plus a lot of Notes containing biographical information “with proofs and authorities for statements or suppositions”. Users of the Charts will quickly conclude that he was selective, but he was selective out of necessity. He deserves our admiration for what he achieved at a time when there were few telephones, and no IGI, computers, fax machines or Internet, so that the principal means of gathering information were visiting libraries, writing letters and making personal visits. Most of the pedigrees, of course, are of English families, although families from Philadelphia, Boston, Ireland and Canada and the Ffrench Pembertons of New Zealand are included, all of them seemingly of a similar social standing to his own. RCB also goes into some detail about coats of arms. One result of his selective approach is that thirteen of his forty family groups are illustrated with coats of arms, and he clearly devoted a lot of time to researching the heraldry of the Pembertons. His son Robert edited and prepared the charts for publication, and they appeared in book form in 1923 with the title Pemberton Pedigrees, under the imprint of the Sidney Press of Bedford. In the Preface Robert hoped that “the interest of the various families may justify the issue of the Notes as a second volume in the near future”, but he also saw the need for further research “to link up most, if not all, of the branches with the original Lancashire stock”. Unfortunately, the Notes were never published so far as we are aware, and their whereabouts, and those of the remaining material, are unknown. The Rev. Robert Pemberton, M.A., editor of Pemberton Pedigrees. In 1923, when the Pedigrees were published, Robert was Rector of Ingatestone, Essex. In the preceding thirty years he had held appointments in Forton (Hampshire), Scarborough (N. Yorkshire), Solihull and Four Oaks (both Warwickshire) and Lyonshall (Herefordshire). In 1905, Robert published Solihull and its church. It is a substantial volume of 229 pages, and in the introduction he acknowledges a debt to his father, who transcribed many documents for him at the Public Record Office and the British Museum. As well as a description of the church (St Alphege), the book contains a brief history of Solihull, lists of previous clergy (some with portraits) and officials, and some account of the surrounding manors and their families with, in some cases, genealogical charts. Information is desired in connection with the early Pembertons of Lancashire and Cheshire, more especially with regard to those branches whose members migrated to S. Albans, co. Herts, and Rushden and Higham Ferrers, co. Northampton, in the 15th and 16th centuries, and regarding James Pemberton of Whiston, co. Lancs., whose estates were confiscated by the Confiscation Act of 1652, cap. 23, and his ancestors and descendants. The Lancashire and Cheshire Record Society’s publications have already been examined, as well as most of those of the Chethan and Surtees societies. A “Geoffrey (or Jeffery) Pemberton, who came from Wiston, co. Lancs., and settled at S. Albans, being descended from the Pembertons of Pemberton Hall, co. Lancs.,” is stated in the Visitation of Northamptonshire of 1681, which is in the College of Arms, to have been the father of Roger Pemberton of S. Albans, who died in 1627, whereas in various Visitations of Hertfordshire, of earlier dates, his father’s name is given as “Robert” whose wife’s name was “Catherine.” In some this Robert is styled “of S. Albans.” Anything tending to elucidate the facts would be useful. The undersigned would be glad to enter into communication with any Pembertons or others who may be interested in such inquiries. 13, Creswell Gardens, South Kensington, London, S.W. Robert died at the age of seventy-one on the 23rd September, 1940, at Mill Hill Emergency Hospital, Hendon, Middlesex. As well as being Rector of Ingatestone, he had also been Rural Dean of Brentwood since 1937. The funeral announcement in The Times on 26 September stipulated “no mourning, no flowers”. He was buried in Brompton Cemetery on 27th September, near his wife, Ethel Frances Pemberton, who had died ten years before, and the service was conducted by the Bishop of Barking, the Rt. Rev. J.T. Inskip. The family mourners were Miss C. Pemberton (sister), Mr. G. P. Burn (grandson), Miss B. Arnould (sister-in-law) and Col. Sholto Pemberton and Lady Wingate (cousins). A memorial service held at the Parish Church, Ingatestone, at the same time was attended by many clergy from the diocese. The service was conducted by the Bishop of Chelmsford, Dr. Henry Wilson. An obituary in The Essex Chronicle on 27th September headed “Ingatestone’s Loss”, said the Rev. R. Pemberton had been ill for about three months. It gave details of his career and said he was of a most kindly nature, broadminded and generous-hearted. He had been a valued member of the Chelmsford Rural District Council and the Board of Guardians. He was never happier than when describing the features of Ingatestone’s delightful old church to visitors. The family grave in Brompton Cemetery, London. Here are some photographs of the burial site. The engraving reads: “In the ____ memory of Major General Robert Charles Boileau Pemberton”. *FindMyPast.co.uk shows RCB being born and baptised in Calcutta in 1834. The record can be found in their British India Office Births & Baptisms data.